You may have recognized a few 1960’s-inspired decorations at our Atlanta-area IHOP’s this month as IHOP teams commit to helping our kids get their groove back at Children’s Healthcare of Atlanta. Throughout February, 60 IHOP teams across metro Atlanta are supporting our miracles by offering $1, $5, and $100 balloon donations to customers leading up to IHOP’s National Pancake Day on February 27. Last year, IHOP raised over $113,000 for Children’s and are hoping to exceed that total this year. 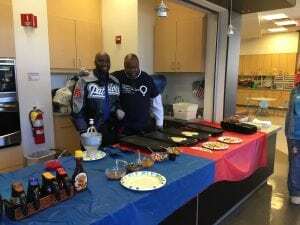 IHOP kicked off their February efforts by making a few of their world-famous pancakes for our patients at Children’s at Scottish Rite Hospital in addition to hosting their third annual Miracle Saturdays event. 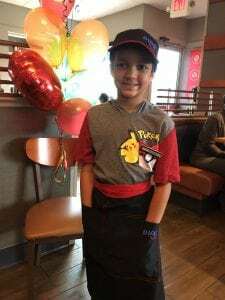 Miracle Saturdays offer patients a chance to serve as the VIP host or hostess at a local IHOP while sharing their inspiring Children’s story with guests and IHOP employees. Our IHOP teams ensure each and every Miracle Saturday patient leaves feeling like true VIP’s through personalized items signed by IHOP teams and decorated VIP booths, IHOP gear….and of course pancakes. Many teams purchase $100 balloons in honor of their Miracle Saturday guests. How can you help? Join us at an Atlanta-area IHOP on Tuesday, February 27 between 7 a.m. and 7 p.m. to celebrate IHOP’s National Pancake Day. Each guest will receive one free short stack of buttermilk pancakes with the option of supporting Children’s Healthcare of Atlanta through a donation. Can’t join on NPD? Help us spread the word with family, friends, community groups, coworkers, etc. using #NATLPancakeDay. Tell us how you are celebrating #National Pancake Day in the comments below and be sure to thank our local IHOP teams for giving it their all for our kids! Previous post: Mark your calendars! IHOP National Pancake Day is Tuesday, February 27.